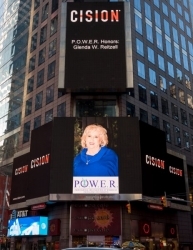 Huntsville, AL, March 29, 2019 --(PR.com)-- Glenda W. Reitzell of Huntsville, Alabama has been showcased on the famous Reuters Billboard in Times Square in New York City by P.O.W.E.R. (Professional Organization of Women of Excellence Recognized) for her outstanding contributions and achievements the field of community outreach. Times Square is one of the world’s most visited tourist attractions, drawing an estimated 50 million visitors annually. It is the hub of the Broadway Theater District and the world’s entertainment industry. Glenda Reitzell is a co-founder and independent consultant with Grace Space LLC, a nonprofit organization dedicated to providing counseling and other services to those in need. The nonprofit operates solely on donations from contributors and by selling small items they make. Glenda is responsible for giving workshops and providing therapy, group psychology programs, group development, leadership development, fundraising and community outreach. She manages, directs, and selects projects that improve the lives of individuals who need an improvement in their space in this world. As a military wife, Glenda spent her adult life in service to others. During her years as an Army wife, she served as a volunteer, director, president and facilitator. She volunteered for the American Red Cross, various thrift shops, museums, and officers’ wives clubs. She was the director of Red Cross volunteers and the director of several family support groups. Glenda was twice elected as mayor of the military community where they lived. The Reitzell family received recognition in 1983 as one of several “Great American Families” awarded by First Lady Nancy Reagan. She also received numerous honors for her service, including the Commanders Award for Civilian Service and the prestigious Patriotic Award for Civilian Service which was awarded at the national level. Ms. Reitzell was appointed by the Alabama Governor to the Alabama Space Science and Exhibit Commission. This is the governing body of Space Camp and Space Camp licensing worldwide. Ms. Reitzell received her B.A. in Behavioral Science from Jacksonville State University in 1989. She is the Vice Chairman of the Executive Committee of the Republican Party of Madison County, Alabama and 1st Vice President of Republican Women of Huntsville. Glenda is a member The Garden Guild of the Huntsville Botanical Garden, Kappa Delta Sorority and Phi Alpha Theta. Glenda has been married for 48 years to Colonel (retired) John Reitzell. Their son Michael and his wife Michelle have two daughters, Emma and Ava, and live in West Palm Beach, Florida. Their daughter Robyn and her husband Brian live in Atlanta and have a daughter Allie and a son Matt. In her spare time, Glenda enjoys travel and reading. For further information, contact www.gracespacecharity.com. All donations are tax deductible.